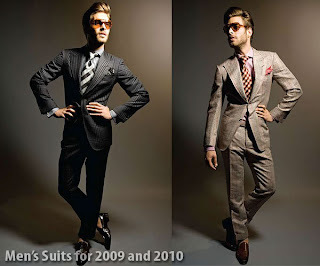 The photo at the bottom is a male model in the latest 2010 trend for men a tailored suits, I know your thinking men have been wearing suits for many of years now but the question is will an everyday men that is not a model where this suite like this? Well there are your very stylish men, that will wear this suit exactly how it's shown in the photo but, for all you men out there that think this is way to dressed up and want to make it more casual I have some tips for you! The photo at the bottom is of a handsome EVERYDAY men that was on his way to work, while still looking trendy but not to corporate he substitute slacks for a pair of dark jeans while still having on a collar shirt with a tie and a vest to make his outfit look more semi-corporate. He also adds a fun colorful scarf to add to the overall outfit. So the key point guys for down playing your suite is to change your slacks to jeans and add accessories like a scarf and you will be all set!